The BoatHoist aluminium boat trailer is ideal for people who take a car-topper tinnie when towing a caravan or camper trailer. It is Designed by us and manufactured by us so it is Australian Made with structural grade aluminum. The boat trailer is designed for easy storage when towing a caravan and can be assembled into 2 travel packs that can be mounted on the caravan bumper bar or quickly separated into 5 smaller parts if you have limited storage options. Please view the FAQ section at the bottom of this page. 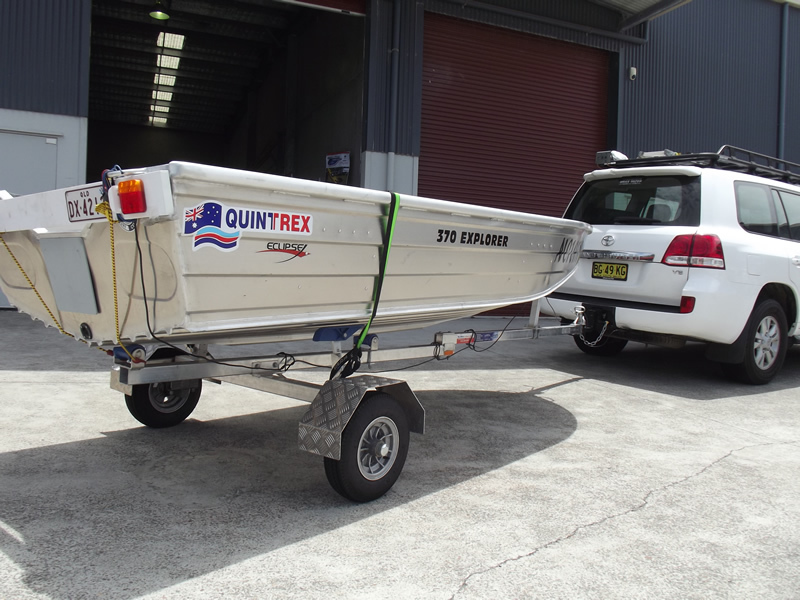 We supply our Folding Boat trailer direct to our customers so you are dealing with the manufacturer NOT a salesman. 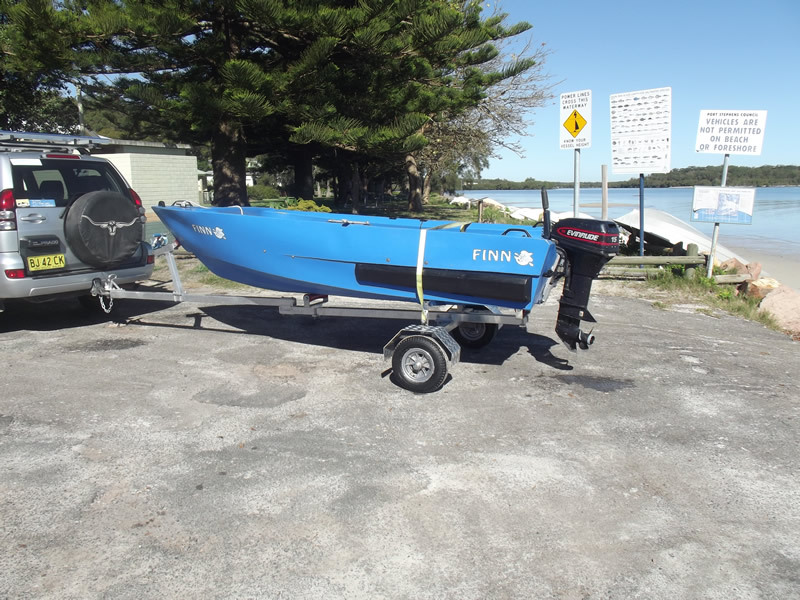 The folding boat trailer can be freighted direct to your door in all Australian states or you can pick it up from our Nelson Bay, NSW 0r Sunshine Coast workshops provided you phone us first. You will need to supply your own trailer light board for registration. Can your folding trailer be registered? Yes. All Folding Trailers must be built in accordance with the following Australian Standard. National Code of Practice: Vehicle Standards Bulletin 1, Revision 5 June 2009. The BoatHoist Folding Trailer is approved by the N.S.W Roads and Maritime Services, comes with a VIN number and compliance plate and can be registered in all Australian states. All you need is a trailer light board and you are right to go. Do I need a weighbridge certificate? No, our trailers are pre-approved so no weighbridge ticket is required. Do the 8” wheels mean the trailer can’t be towed at 100km/h? The speed rating that you can tow your folding trailer does not depend on the tyre size. 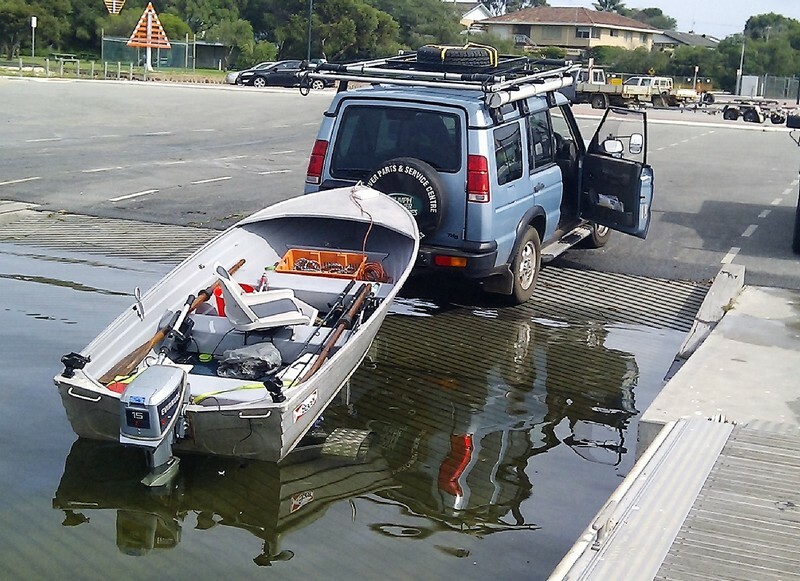 The BoatHoist folding boat trailers are fitted with 8” integral wheels that are rated to 130km/h and run standard Holden wheel bearings. The reason some manufacturers limit the tow speed of their trailers is because the poor trailer design results in their trailer getting the wobbles. The BoatHoist Folding Trailer will tow safely at 100km/h and can be towed long distances on sealed roads with no problems. How much does your aluminum trailer weigh? Our trailer weighs 40kg without the hand winch and 42kg with the winch fitted. Compare this to a steel folding trailer and our trailer is about half the weight. Absolutely. Aluminum is used in all forms of craft construction from cars to aircraft to high speed trains. Your tinnie is made of aluminum – your not worried about IT breaking are you? The difference between steel and aluminium lies in the welding. A steel weld is just as strong as the parent metal but the strength of an aluminum weld depends on its size. The key to the success of our trailer design lies in the fact that we transfer load stresses directly from section to section using bolts, not through the weld itself thus avoiding material failure. Why do you use bolts instead of pins on your BoatHoist Folding Trailer? 1) Pin connections or hinged connections can wear, particularly with aluminium as it is not as hard as steel and this will reduce the life of the trailer. The same thing applies to telescoping sections as they can get a buildup of dust and salt or the sections can get bent all of which will stop them sliding together. 2) Pinned and hinged connections have a degree of movement. It is this movement that affects how the trailer tows. As you increase speed the trailer starts to wobble, the faster you go the more the trailer wobbles. This is why some manufacturers have a speed limit on their trailer. The bolted connections on the BoatHoist Folding Trailer eliminate any joint movement so our folding aluminum trailer does not wobble and will tow safely at 100 km/h. 3) By bolting our trailers we have the option of packing the trailer into two travel packs, the drawbar and the axle assembly that can be mounted on your caravan or the trailer can be separated into up to 5 separate pieces giving you plenty of options for storage. What size does the BoatHoist Folding Trailer pack down into? The Drawbar pack is 2.1m long and weighs 12kg. The axle pack is 1.1m long and weighs 28kg. You can also separate our trailer into 5 separate pieces if needed. Do you have a mounting bracket for the caravan bumper bar? Yes we have a bracket that will fit onto a 50 x 50 or 50 x 75 RHS bumper bar and this will support the axle assembly. The drawbar assembly can be carried on the roof with your cartopper tinnie, across the rear of the caravan our it will even fit into a through boot of your caravan. Please request this when ordering. What size boat can your trailer take? Our folding trailer is rated to 250kg and is 4.1metres long when assembled. 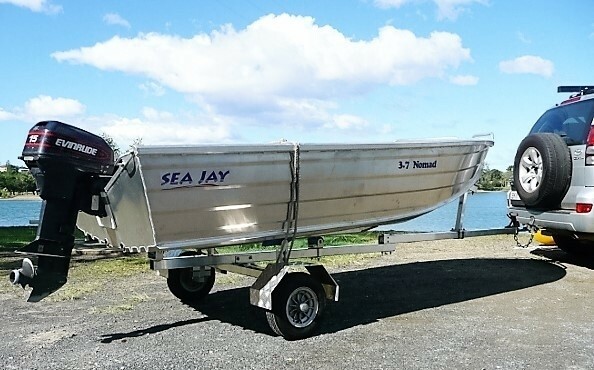 It will safely carry a 3.95metre aluminum boat in saying that, we recommend the best size for a cartopper boat should be a maximum size of 3.75metres. The folding trailer does not come with lights. You need to supply your own trailer light board. These are available from most boating and automotive stores across Australia and should be hung off the back of the boat when towing. Can the BoatHoist trailer be used as a full time trailer? We do not recommend you use our trailer as a replacement for a full time steel boat trailer. Our trailer, like all other folding trailers, is designed for part-time use to and from the caravan park to the nearest boat ramp. Does BoatHoist make a trailer to suit inflatable boats? What sort of warranty comes with the BoatHoist trailer?